Audi's A3 is the smallest car in the range, offering the premium strands of build quality and desirability in a compact package. The final model in the range is the S3, a high performance version in the same vein as other 'S' models in the Audi line-up. The S models in the Audi range have a long history, and have been amongst the most exciting products to come from the German manufacturer. 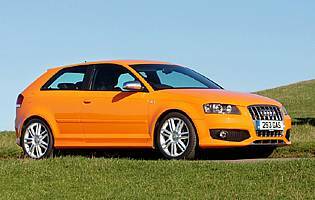 Combining high output engines with the famous quattro four-wheel drive system, they are amongst the most usable performance cars on sale. 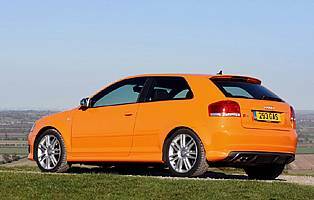 The S3 continues in that manner to make possibly the fastest hot hatch on sale today. At the heart of the S3 is the 2.0-litre turbocharged petrol engine. Using the T-FSI technology seen elsewhere in the Audi range, it uses direct injection to increase efficiency and power. The end result is a highly impressive output, making the S3 significantly more powerful than its predecessor. To cope with the high power output, the S3 features the quattro four-wheel drive system as standard. This layout is unusual in the hot hatchback sector, and as well as giving the necessary grip and traction to exploit the power in all conditions, it gives the S3 extra cache over its rivals. As well as the mechanical enhancements, the S3 benefits from a number if styling changes to distinguish it from its stablemates. 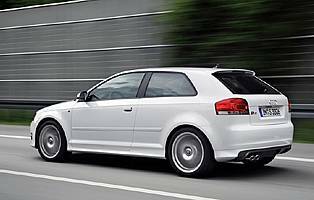 Available in three-door form only, the S3 has a chrome grille, extended spoilers and skirts all round. At the rear there is also a silver-coloured aerodynamic diffuser and twin exhausts pipes, plus subtle S3 badges front and rear. The S3 makes a strong case for itself as a complete all rounder. It offers enough performance to satisfy all but the most hot-headed of drivers whilst remaining civilised and comfortable. Running costs for the S3 will be relatively high. The initial purchase price is high for this type of car, as is the insurance, although the fuel economy is quite good for the performance available. The S3 is just as practical as regular A3s, with a fair amount of room front and rear. The boot is also class competitive in terms of size, and there are plenty of storage spaces within the cabin. The interior layout of the S3 is excellent, with clear and attractive instruments and switches, all constructed from high quality materials. The control systems are good too, with a version of the Multi Media Interface controller making it easy to navigate through the systems. Considering its performance, the S3 is impressively comfortable. The seats are excellent, providing a high level of support, and noise levels are well controlled. The ride quality is also good considering the sporty nature of the car. A standard fit alarm and immobiliser comes with all A3 models, and combined with remote central locking should ensure that the S3 remains secure. A high level of safety comes as standard with the S3. Not only does it have a powerful engine, brakes and the security of four-wheel drive, it also has ESP, and a host of other safety devices to help avoid accidents. Should the worst happen, a full complement of airbags including deactivation for the passenger seat will help. The S3's appeal comes from its ability to deliver high performance and handling whilst remaining civilised in normal use. The 2.0-litre turbocharged engine is impressively flexible and accelerates hard up to the red line. The gearshift is sufficiently quick and slick, and the brakes strong. The steering is accurate although not suffused with feel, it does it feel secure though. When driven at normal speeds, it is comfortable and undemanding. The S3 can provide decent family transport given its decent space inside. The three-door only configuration is a slight demerit in this area, but otherwise it is perfectly capable of performing family duties. The S3 is likely to be outside the reach of most new drivers, given its price and insurance costs. It is however easy enough to drive for the inexperienced to cope with easily. The quality of the S3 is very impressive. Inside and out there is a strong feeling of robustness and high quality, and all the controls operate with impressive solidity. The S3's image is strong, building on the reputation of Audi and the S series models, although it might be seen as being outside of the regular hot hatch market due to its price. Gaining access to the S3 is no problem at all, with wide opening front doors and good access to the rear seats for a three-door car. The boot also opens to give a large aperture for loading, although a minor irritant is the automatic locking, which requires the boot to be unlocked every time. With the optional Bose stereo upgrade fitted, the S3's stereo system is impressive. As well as a CD/tuner it can also accept MP3 discs, and produces excellent sound quality. To emphasise its sporty nature, the S3 is available in a handful of colours that are not available on regular A3 models. The brighter hues such as yellow and orange do help the looks, which may be too understated for some. Inside the same is also true, for although the cabin plastic is black, aluminium inlays are available as are bright hues for the fabrics. The S3 is no more difficult to park than a regular A3, with good all-round visibility and parking sensors available as an option. The only possible demerit is the large alloy wheels, which could easily be kerbed. Petrol engines: 1.6-litre (102bhp and 115bhp), 1.8-litre (160bhp), 2.0-litre (200bhp and 256bhp), 3.2-litre (250bhp). Diesel engines: 1.9-litre (105bhp), 2.0-litre (140bhp and 170bhp). Five-speed manual transmissions are fitted to low output 1.6-litre petrol and 1.9-litre diesel modesl, all others are fitted with a six-speed manual. An S-tronic dual clutch automated manual transmission is available on 1.8-litre, 2.0-litre 200bhp and 3.2-litre petrols and 2.0-litre diesel models. Trim levels are base, SE, Sport, S-Line and S3.